Justin and I went to FreshFarm’s Penn Quarter Farmer’s Market yesterday and had a wonderful time wandering around. We went with the goal of getting eggs and peaches, but left with two bags full of delicious produce and flowers. We started off grabbing two pain au chocolate from Quail Creek Farm, a bakery outside of Hedgesville, West Virginia, and an iced tea from nearby Teaism, as we were feeling too hungry to control ourselves and probably definitely would have started buying everything in sight! After we felt somewhat satiated, we picked up some broccoli and green onions for a stir fry. The garlic they were selling was perfectly shaped! We also grabbed some peaches and snap peas (mmm, stir fry) from another farmer and eggs from yet another farmer. We bought a bunch of beautiful purple zinnias from Wollam Gardens, an outdoor grower of cut flowers, located in Jeffersonton, Virginia. We completed our Farmers Market rampage with delicious bacon from the Neighborhood Restaurant Group’s Red Apron Butcher. Besides at Farmer’s Markets, Nathan Anda sells his hand cut and cured meats at both Planet Wine’s shop and as part of Buzz’s delicious paninis. We have already cooked the bacon and scrambled the eggs: a perfect start to a holiday weekend Friday! 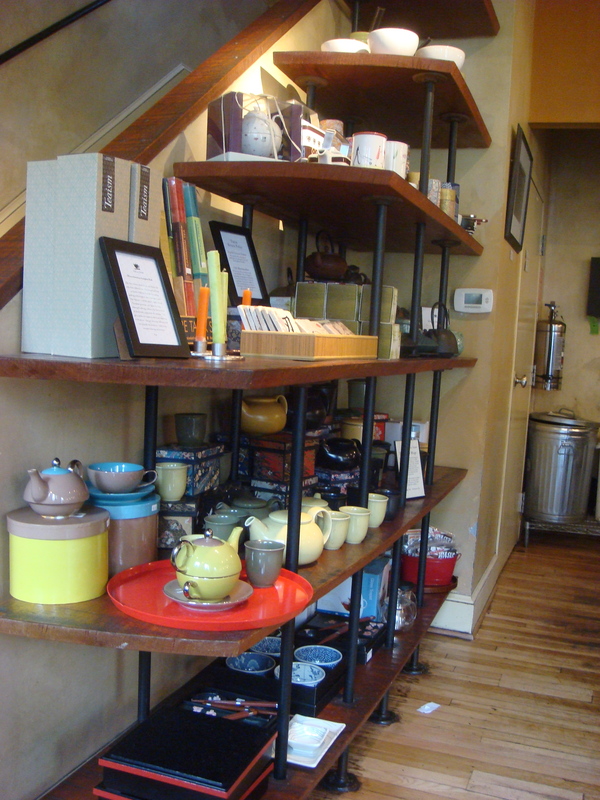 I especially like the Dupont Circle location: it is 2 stories and full of wonderful smells, a fantastic selection of tea (to buy and drink) and tea-related drinks, as well as a creative menu of food. I smelled and saw some absolutely incredible looking snowpea stir fry tonight! Teaism is also home to some of the most comforting Chai-Tea I’ve ever tasted: it’s really warming and soothing.